5-pack of stand up paddle board hats from SUP ATX. One size fits all, snap closure, mesh back with SUP ATX logo on the front of hat. 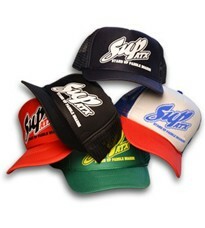 5-pack of hats ships in assorted colors. Keep the sun out of your eyes when you're paddling across the water with our SUP ATX hats! Quality one-size-fits-all construction with adjustable snap closure and mesh hat, and SUP ATX logo stamped across the front. Lightweight, easy to wear, and with our 5-pack, easy to share with friends as well. Pick up a pack and paddle in style. Comes in assorted colors.